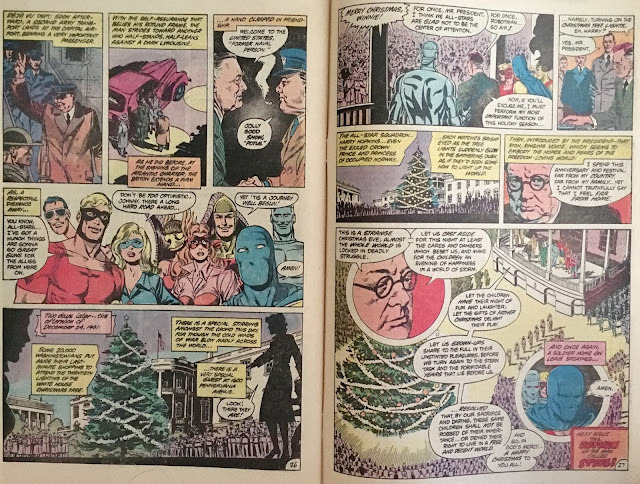 Today we're going to stick with our Christmas on Infinite Earths... in July! 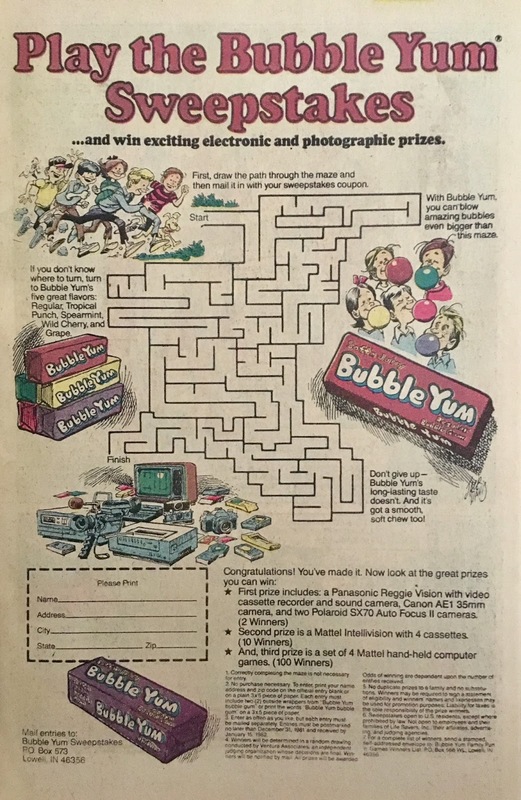 special, and discuss an issue that barely even mentions that it's the most won-der-ful time of the year... mostly because it was during World War II, and that might've been a bit more important. We open on December 22, 1941 with the news that the Justice Society of America has decided to disband! They have stepped down from their superhero roles to actually enlist in the United States Armed Forces! A pair of trenchcoated figures walk down the street, bumping into a Private Pratt, before heading down an alley where they are stood before a poster for the film Nazi Agent (an actual 1942 film starring Conrad Veidt). They give the ol' Hitlerian salute and the brick wall rises. 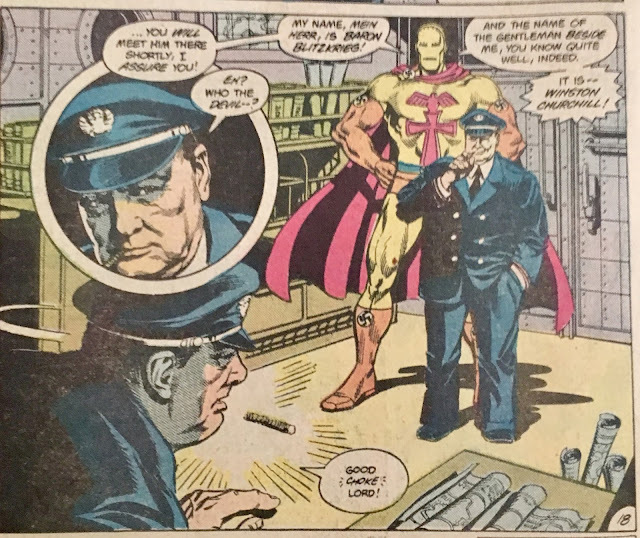 Inside the tall fella sheds his trenchcoat revealing himself to be Baron Blitzkrieg! His diminutive associate is Major Zwerg. The pair are greeted by s'more Nazis... with "heils", reminding me of that Jerry Seinfeld bit where he jokes about the different kind of "heils" between Nazi officers, with the casual one being a "heil'ya doin'?" Anyhoo, they are there to watch a film... in it, British Prime Minister, Winston Churchill arrives in the United States to meet with President Franklin Roosevelt. When they shake hands... they explode! Well, hell... it turns out these are robots, naturally... and perhaps not as convincing as they need to be. At this point, FDR had been stricken with Polio and was in a wheelchair most of the time. In public, he would be on a cane and have a person to support him... none of this is depicted in robo-Roosevelt. This film, I should mention, is to be sent out to Berlin to be shown as evidence of the death of Allied leadership... but the plan is to abduct them and put them before Der Fuhrer himself. We shift scenes to President Roosevelt reading a copy of LIFE Magazine, when he is visited be Private Pratt... well, the Atom that is. 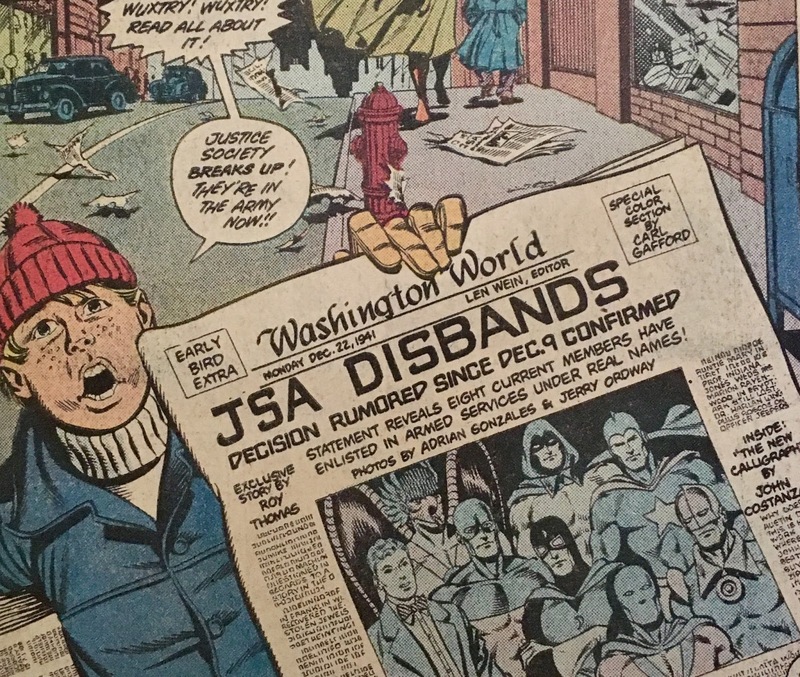 The LIFE magazine features a cover story about the JSA's disbandment and, I can't quite make out the back cover ad, but I'm going to assume it's legit. Roosevelt's dog Fala is sitting on his lap, another neat nod to actual history. A note in the letters page states that Fala was the most photographed pooch in the world at this point. 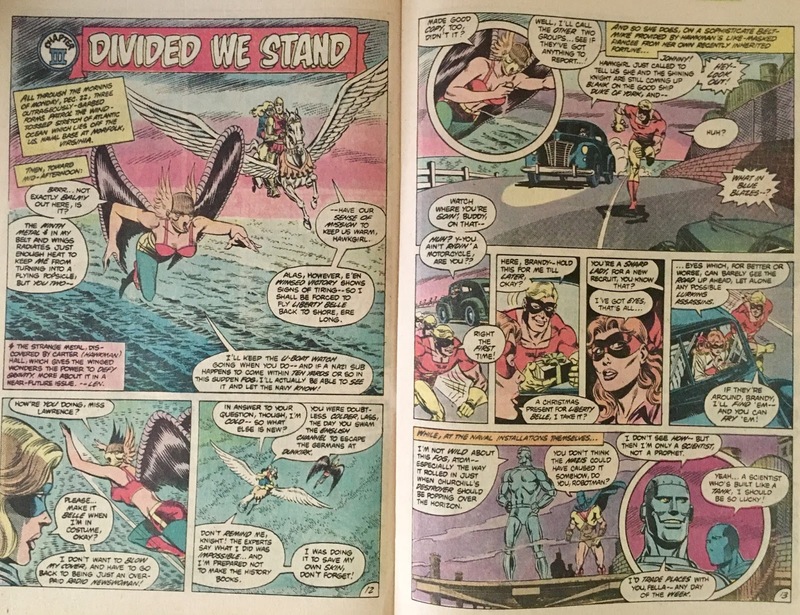 The two catch up, discussing events that occurred in a Blue Ribbon Digest where Pratt had saved Roosevelt's life, jumping in front of a Valkyrie blast. I'm guessing it was here where many members of the Society decide to enlist. 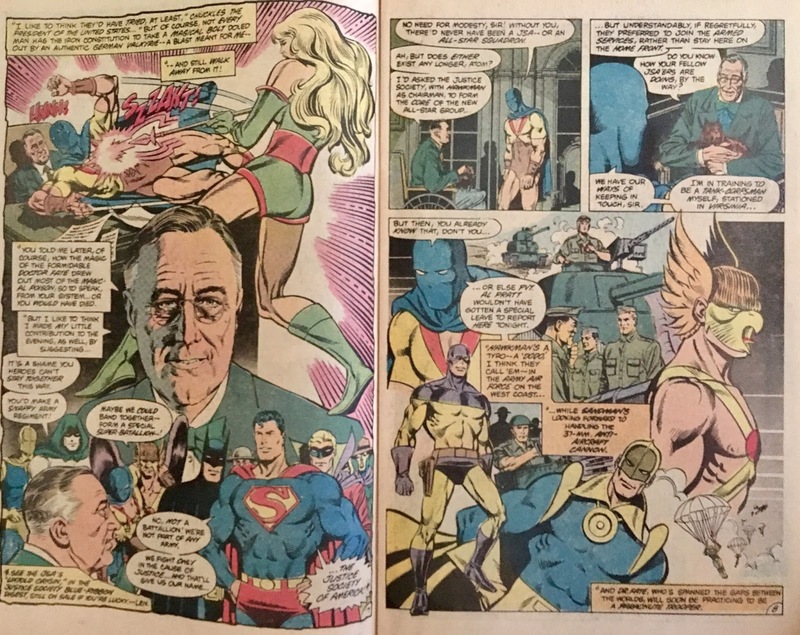 FDR asks the Atom how the new recruits are doing, and he goes down the roster... he is a Tank-Corpsman, Hawkman is a "Dodo" in the Air Force, Sandman is Anti-Aircraft, Dr. Fate is a Paratrooper, Dr. Mid-Nite is a Captain in the Med-Corps, Starman is in flight training, and Johnny Thunder (oof) is in the Navy. 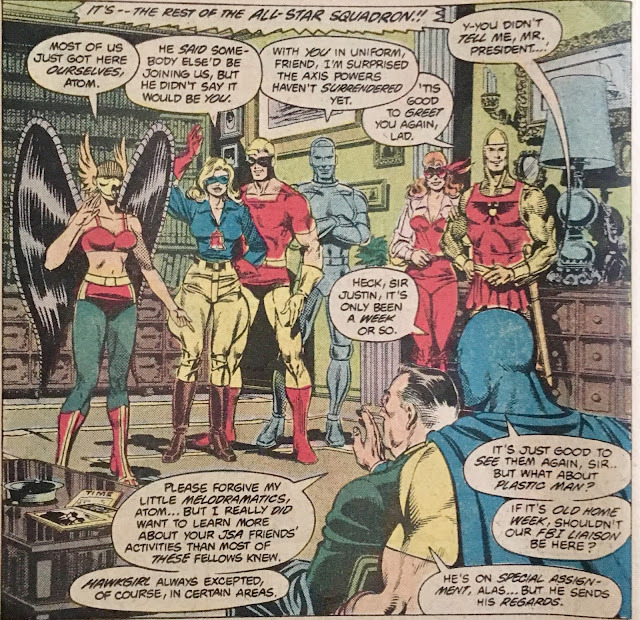 In the next room, the President has assembled members of the All-Star Squadron. He has received word that there is a "plot afoot" to kill PM Churchill when he arrives stateside. The All-Stars are quick to offer up their services as security detail for the British Destroyer battleship, Duke of Earl. It's pretty cute seeing the heroes literally sprinting down the hallways to head out. We rejoin the heroes later that day. Hawkgirl, Liberty Belle, and Shining Knight are on U-Boat watch over the Atlantic, Firebrand and Johnny Quick are on the roads (of note, Johnny hands Firebrand a Christmas gift... to hold on to for Liberty Belle... cold-burn). Meanwhile at the Navy yard, Robotman and the Atom are admiring... or lamenting, the (ominous) heavy fog that has drifted in. Time passes, and the Destroyer finally appears. It looks as though it will safely dock at the Naval yard when.... Bhh-kooom! It's nailed by a torpedo (which I typed as tornado... backspaced... and retyped as tornado)! Atom and Robotman board the boat... but take on a barrage of blasts from the befuddled Brits. They are able to convince them of their credentials and go about starting their rescue. 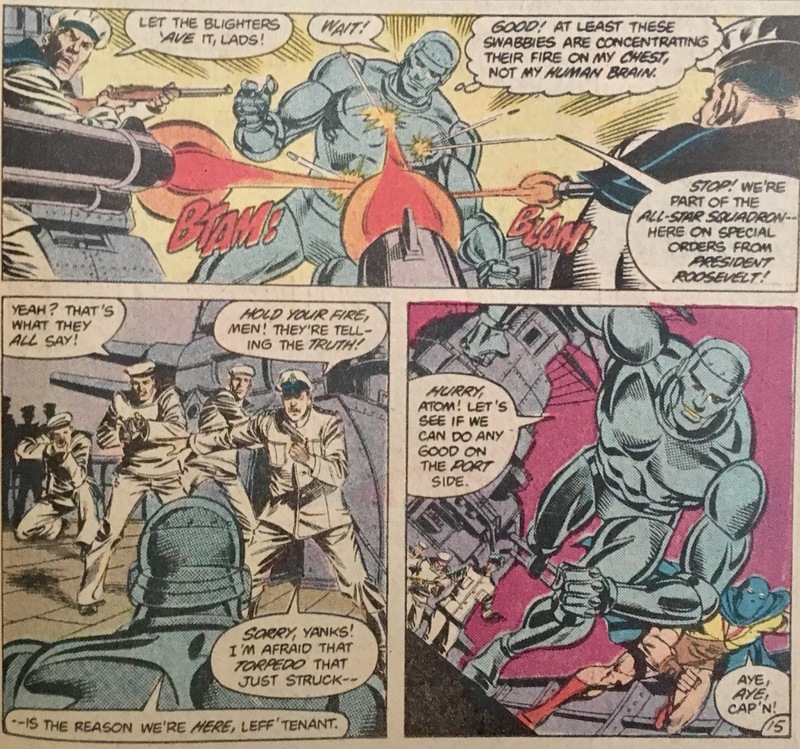 Robotman scans the seas, and locates a U-Boat. Turns out the sub was equipped with an attachment that caused the foggy sea air, affecting visibility all around. He throws a thick cable to Shining Knight to try and capture the sub. Liberty Belle catches it and takes a dive in the freezing cold late-December water. 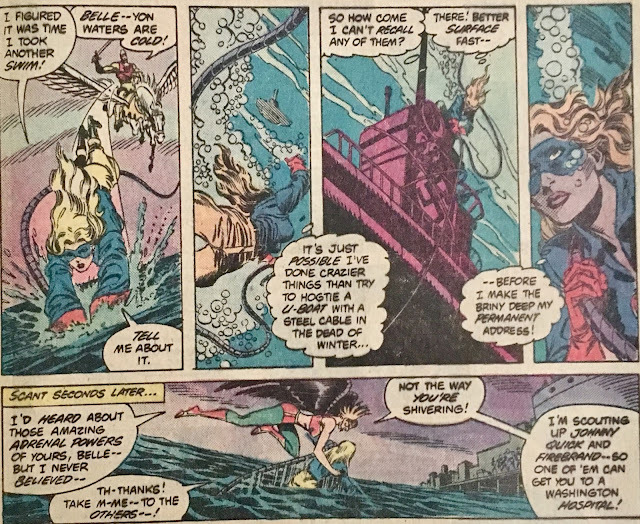 She wraps the U-Boat up, after which, Hawkgirl plucks her from the sea. Robotman sets to yanking the German's outta the drink with some good ol' American brute strength... and a winch. Meanwhile on board the Destroyer, Baron Blitzkrieg (feels like we haven't seen him in months!) is visiting with Winston Churchill. On the beach, Robotman has nyoinked the U-Boat ashore. The Atom asks that the military stand down to entice the Germans into exiting their craft. They do, they do too, and we get ourselves a bit of a battle, which ends just about as quickly as it begins with the All-Stars victorious. We later join Baron Blitzkrieg and Major Vatziisface as they are sending the Churchill-bot to meet with President Roosevelt. Hmm... okay, perhaps Der Fuhrer only wants private audience with Churchill then. 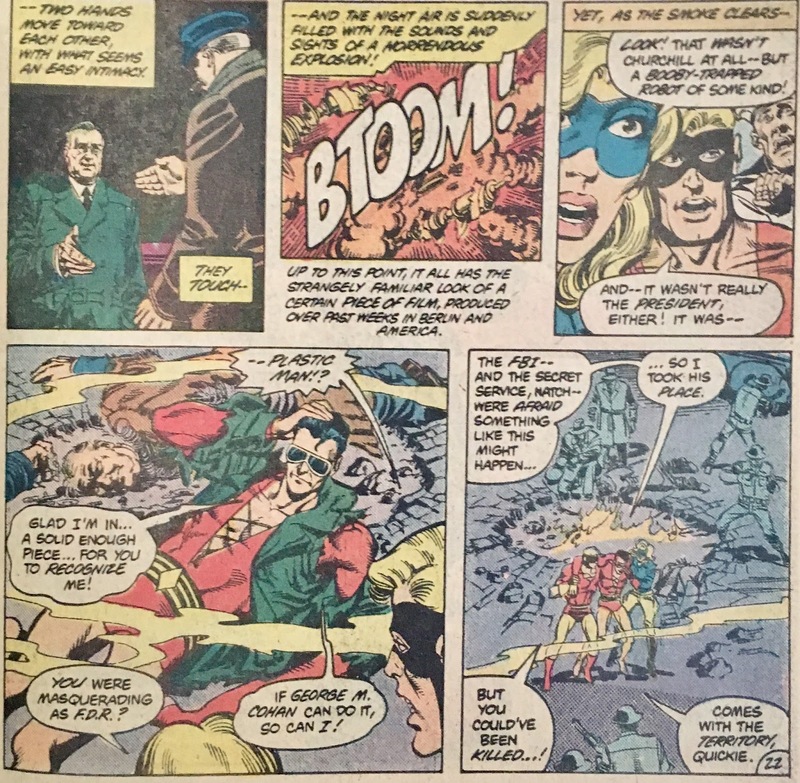 Anyhoo, Liberty Belle and Johnny Quick are present, and note that Churchill isn't acting quite himself... he doesn't recognize them, for one... for another, his stogie ain't lit. Anyhoo, he trudges up to the Prez, extends his hand, and... BOOM! Just like in the movie. When the dust settles, however, it turns out that "FDR" was really Plastic Man! Thinking their work is done, the Baron and his puny pal drive away. 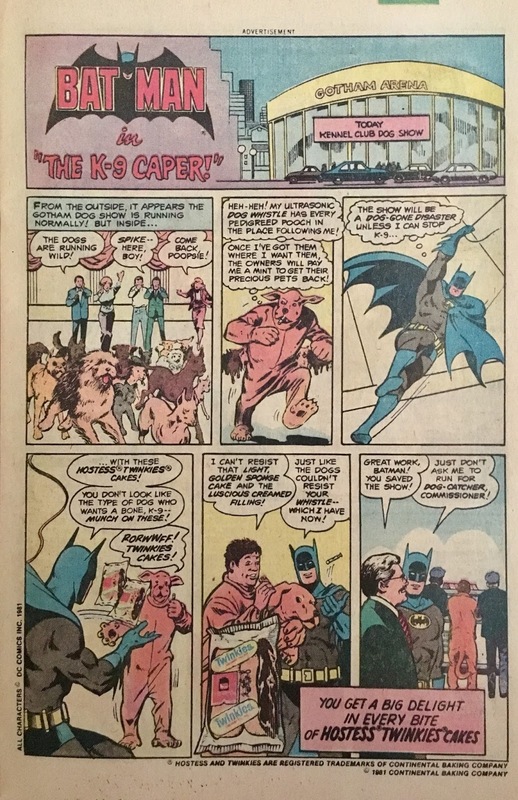 Luckily, the rest of the All-Stars are present to slow his escape. 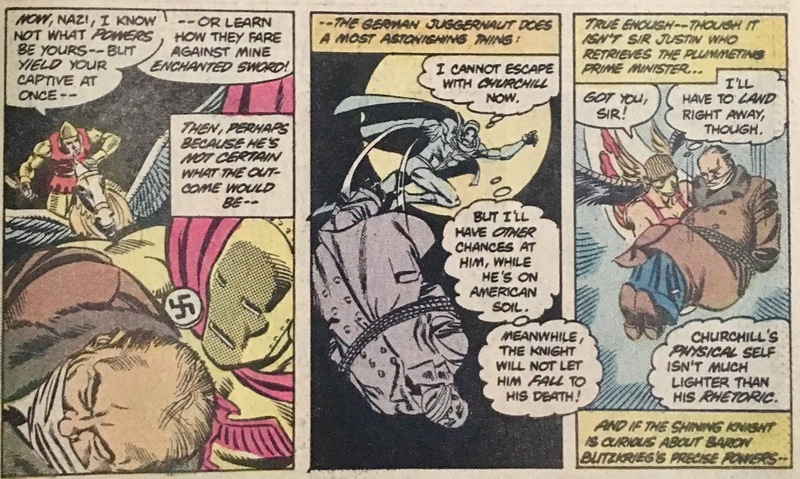 The Baron wallops Robotman with a right, then attempts to fly away with Churchill in tow. 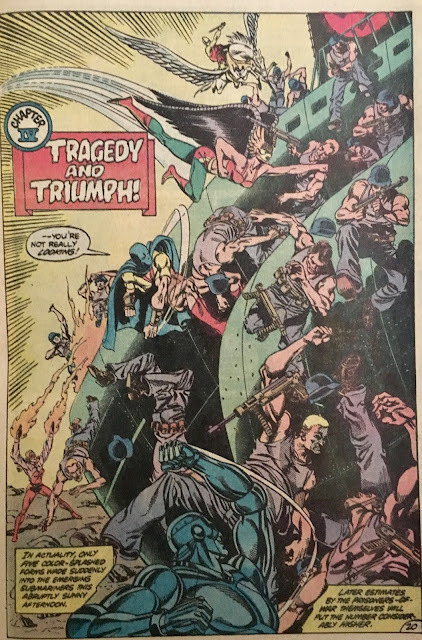 Shining Knight gives chase, and the Baron, knowing he can't flee as fast with the added-Winston weight, drops the PM into Hawkgirl's waiting arms. In the distraction the miniscule Major escaped as well. Our story ends December 24th, 1941 at the White House where Churchill and Roosevelt meet in friendship. The All-Stars are present for the traditional lighting of the White House Christmas Tree (oh yeah, this is a Christmas issue!) and to hear Winston Churchill's (actual) stirring speech on the White House lawn. As much as I love this series, it's always such a daunting task to go through and synopsize it. It feels like I'm doing it a disservice (and I'm sure I am, in more ways than one). These issues are jam-packed with story, sidebars, actual United States/World history... just so densely written that I almost need a rest break after finishing one! 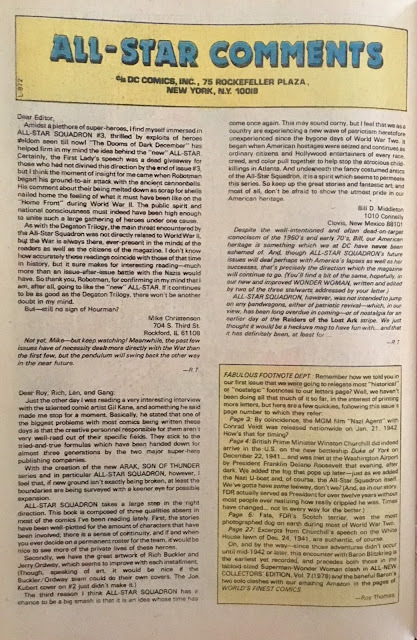 I've said it before, will again, and will now... Roy Thomas doesn't mess around when it comes to making everything fit. Fiction/non-fiction/historical (pop)culture/continuity... everything works here! 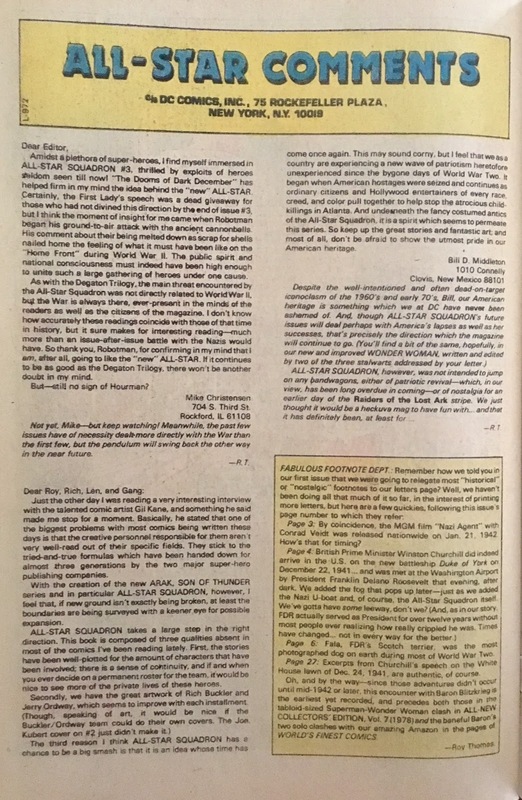 What's not in the story... is included as a footnote in the letters page for chrissakes! 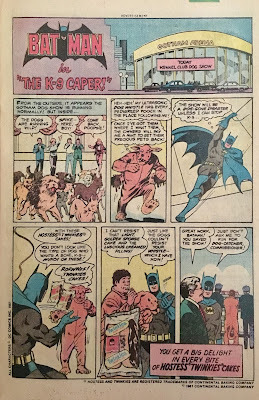 He does such an amazing job of capturing the gestalt but not being a complete slave to it, it's clear that this series (and his eventual "corner" of the DC Universe) is a labor of love... and that makes following along all the more engaging. With that said... and, this is going to sound pretty hypocritical, but... I love how Thomas is weaving real-world history into this story. Yeah, I'm a guy who hates when a sitting President is used in comics, or when comics are politically motivated... but this just feels perfect! 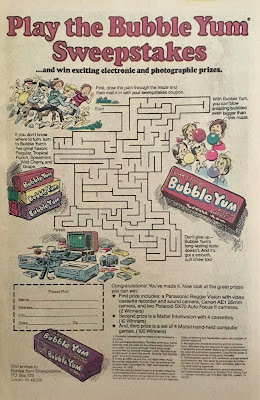 Perhaps it's the passage of time... maybe it's the fact that I wasn't even born until nearly a half-century after this went down... 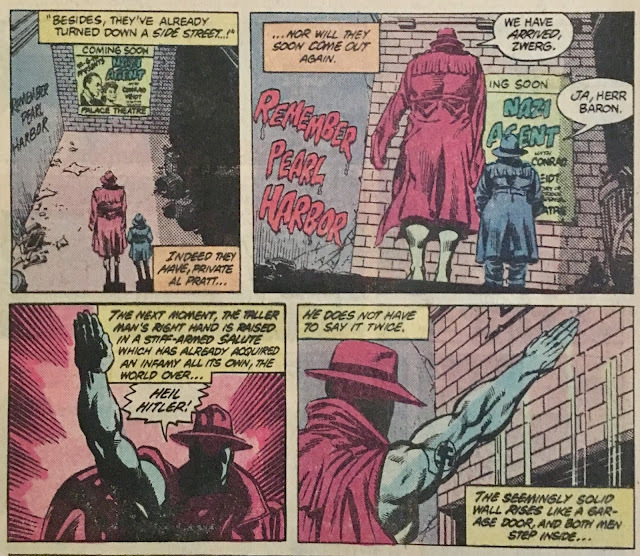 I suppose stories of Franklin Roosevelt, Adolf Hitler and World War II are just so far from anything I can wrap my head around that I can mentally allow comics to "use" history here. Maybe it's that such names feel so important and legendary, that they belong in comic books? Who knows? The issue itself, it's a really good time. I appreciate being given the Atom as sort of a touchstone/POV character, as these All-Stars, while not totally unfamiliar to me, are less-so than JSA members. I'm still very much "meeting" these folks... as many "back in the day" readers would be too, as this is only the seventh issue of the book. I wasn't entirely clear on the purpose of the robo-Roosevelt/robo-Winston bits... I thought Blitzkrieg was trying to abduct both men, but it appears as though Der Fuhrer's personal beef was with Winnie at this point. At least I think that's how it was meant to go? Churchill gets captured, Roosevelt goes boom? Speaking of clarity... here's one that I've always had a sorta nebulous understanding of. The Spear of Destiny... is that a thing at this point? Does that stop all supers from getting into Germany and keeping their wits, or just the "biggies" like Superman and the Spectre? 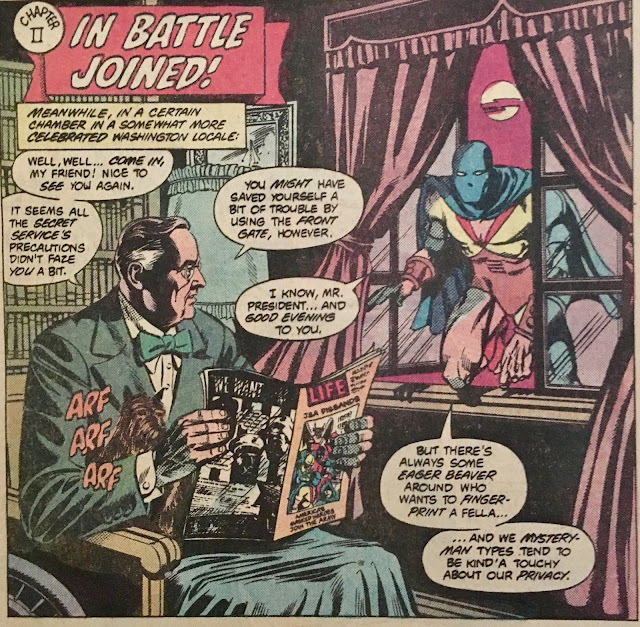 Seems strange that several super-types would enlist in the military if it would be impossible for them to enter into battle. I'm likely misunderstanding it. The Christmas bits, are brief but powerful. The use of actual language used in Churchill's Christmas Eve address was excellent. His message of separating, for one day, the present crisis from feelings of familial love is... again, powerful. The presence of mystery men in the background really doesn't distract from what's truly important. 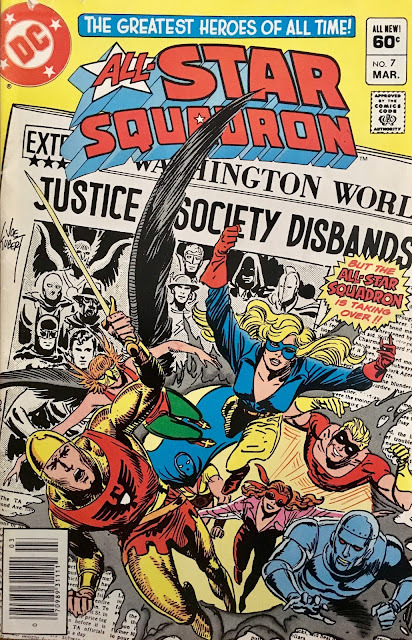 Overall, another wonderful issue of All-Star Squadron... one I'd most definitely recommend. I warn you that it's dense... it's certainly not passive (or quick) reading. If you're more accustomed to comics of today, you might want to pack a lunch! Available digitally and (if you're cool with black and white) as part of SHOWCASE Presents All-Star Squadron. What a great review. This is an excellent issue. I think one of the reasons that it works as well as it does is because of the history that is wrapped up in the story, at least for those of us who did not live through this time, like you mentioned. 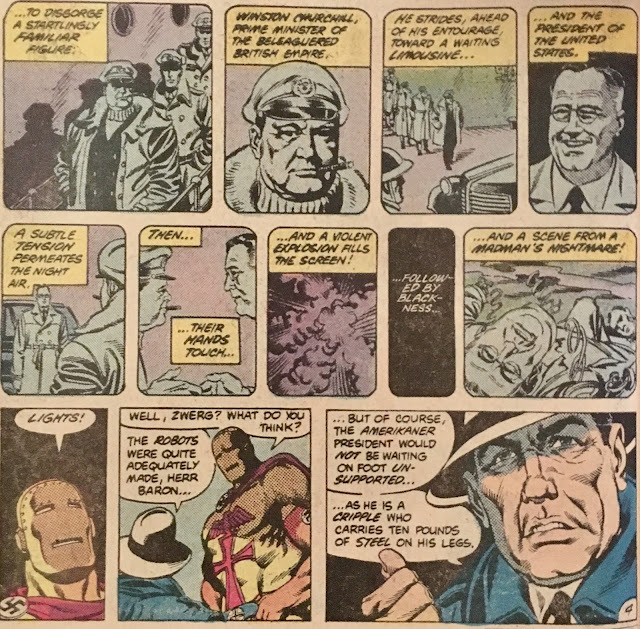 I love how FDR and Churchill interact with the superheros, like they have coffee together every Wednesday or something. It feels so casual, but still retains the respect of the office of President and Prime Minister. Thank you Butch! The Spear of Destiny was always a bit nebulous to me. Wasn't sure if there were any hard-and-fast rules as to who it might affect (and how). Thank you for sharing the info and link!